Your voice is important and we need your help getting the word out to all who love and enjoy Lake Nacimiento. Encourage others to “Like” or “Follow” us on social media. We will update the following social media sites with current information. Talk to your friends and neighbors. Review the current projects and share them with friends and fellow “Lake Naci” lovers! Without your involvement, we may loose the opportunity to recreate and enjoy our beautiful Lake Nacimiento. Stay informed on all the current projects! Don’t let our lake get infected!!! Make sure your vessel is Clean, Drained, and Dry. Make sure you have a current Vessel Screening Permit, or a Resident Vessel Sticker and Resident Vessel Certificate. 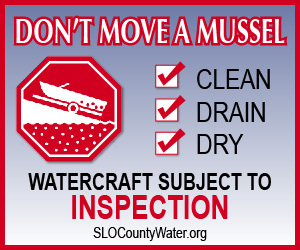 If you are on the lake without a Vessel Screening Permit or a Resident Vessel Sticker and Certificate you are subject to a $2000 fine. Repeated violation of the above may result in your launch ramp being closed. The Nacimiento Regional Water Management Advisory Committee (NRWMAC) represents visitors, property owners and enthusiasts of all sorts that enjoy Lake Nacimiento. Our goal is to maximize the water level in Lake Nacimiento throughout the summer. Monterey County Water Resources Agency (MCWRA) is proposing building a tunnel to divert water from Lake Nacimiento into Lake San Antonio. The Nacimiento Regional Water Management Advisory Committee (NRWMAC) is concerned how the tunnel might affect Lake Nacimiento lake levels, recreation activities, property values, and water availability. Over the last two years the Monterey County Parks Department, who provide law enforcement and Quagga Mussel compliance on the lake, have drastically reduced the Lake Ranger staff and other Parks Department employees. The Rangers provide critical support to communities around the lake and to boaters and fisherman. The staff has been reduced to the point that there are no Ranger boats on the lake.